This year’s Chablis harvest is expected to provide some relief to the French winegrowing region after “two difficult years.” Louis Moreau, president of the Chablis Commission of the Bourgogne Board, said that the unusually warm summer which affected harvests across Europe could lead to this year’s vintage being “the best in 20 years”. Domaine des Malandes are also rejoicing about a harvest that is proving both high quality and bountiful. 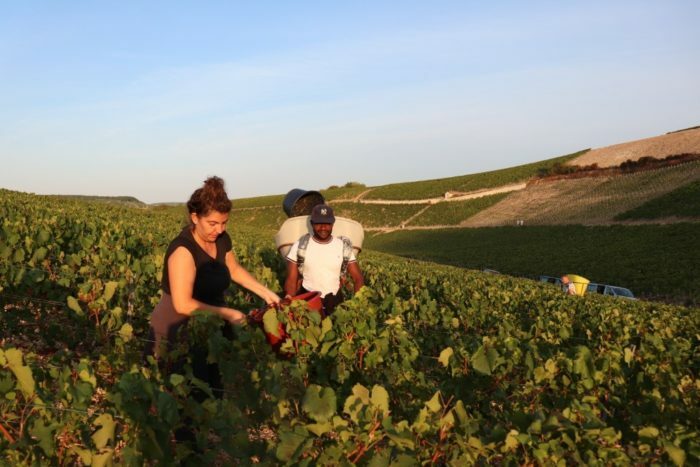 Domaine de Malandes completed their 2018 Chablis harvest from 5th to 16th of September. 25 hand-pickers worked tirelessly to harvest 1ers Crus Fourchaume, Mont de Milieu and Côte de Léchet, and Grands Crus Vaudésir and Les Clos. The vintners remarked that the grapes were in a very good shape. Fortunately, the dry and hot summer felt by many this year, had no adverse effects thanks to the strong roots reaching deep into the soil, plentiful with nutrients from a wet spring. This bumper crop has been gratefully welcomed from all at the Domaine after two half crops in 2016 and 2017. The generous yield is showing excellent quality: high juice concentration and sugar levels.